I recently finished my first book of the year (actually, that’s a lie, I read “Me and Earl and the Dying Girl” but decided not to review it) and I decided I needed to write something up about it. 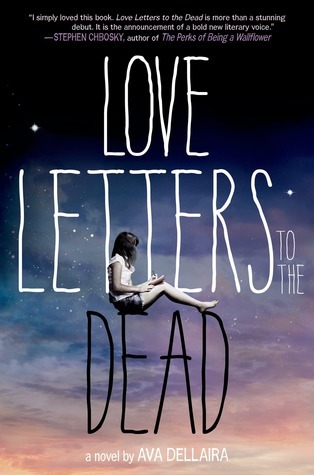 Love Letters to the Dead by Ava Dellaira is about a girl named Laurel is trying to cope after her sister’s death. She writes letters to other dead people, like Kurt Cobain, Amelia Earhart, Janis Joplin, River Phoenix, etc. about her journey throughout her freshman year of high school as she makes friends, loses friends, gets her first boyfriend and struggles with her family problems. I can’t deny that I liked the letters. I liked the book, mostly because I have personally written many letters to my favorite band guys and writing letters is an outlet for me. Dellaira writes in the back of the book how Stephen Chbosky, the author of The Perks of Being a Wallflower, was her mentor for this book and how he helped her write it. You can absolutely tell Chbosky’s words flow through this because it’s in the same style as Perks. A freshman in high school writes letters to a person to cope with their issues. The books are very similar, which is probably why I liked this one. Perks is my #1 favorite book so it makes sense. However, it wasn’t as realistic as I think it should have been. Laurel writes so profoundly and strangely in her letters. One moment, she’s talking like a 10 year old, and in the next paragraph she sounds like a philosophy professor. I can definitely tell you that my writing as a freshman was nothing like this (I also didn’t have great music taste yet, but that’s a different story). I also found it unrealistic that high school freshmen in New Mexico were constantly out partying and drinking. Yes, they had older friends who supplied them with the alcohol usually, but I highly doubt most high school freshmen are out drinking every weekend. Maybe I just don’t know how these kids work because I grew up in a small town and there weren’t many parties, and I wasn’t exposed to this kind of stuff when I was in high school. But I didn’t get it. Something I also didn’t get was that Laurel had no personality. Her friends shaped her into a person that she really wasn’t. She wore her sister’s clothes and listened to her sister’s music and tried to become her sister. Laurel had no Laurel in her, and I didn’t like that. There was also never a description of what she actually looked like, which I find hard in a book. I like to know whether a character is tall or short, what kind of hairstyle they have, and what they like to do. Laurel let other people create her personality and her looks, which is unfortunately what happens in high school. She should have been her own person instead. I don’t think the book is bad. I think it’s very good in describing how much it hurts to watch a family member die, especially a sibling. Everyone experiences loss in their lives, and I think it’s extremely important to show teenagers that loss can occur at a young age. For Dellaira’s first novel, it’s not terrible. But it could have used some work, and could have maybe been a little less like Perks. I was entranced in this book because it was about letter writing and I read the name “Kurt Cobain” on the back of the cover, so that was mainly why I read it. I recommend Love Letters to the Dead to teenagers who like artists like Kurt or Amy Winehouse or Janis or Jim Morrison, and teenagers who have experienced loss and need some kind of comfort. I love the premise of this book but the issue you picked up on – “Laurel had no Laurel in her, and I didn’t like that.” – seems pretty key. I’m always drawn to character driven plots and if I don’t find the characters compelling then the books fall flat. I think this is one book I might skip.